I’ve developed a bit of a preoccupation with watercolors. I was a prolific painter as a child, then grew out of it as I got into cartooning. Then I discovered that Randy Milholland of Something Positive also makes these gloriously whimsical watercolors that are a perfect mash-up of both mediums and I just had to try it out. My first attempts last year were… not the greatest. I started on the wrong kind of paper, then the colors were dull, and the black permanent ink I was using for the line art didn’t stand up to the watercolors, which would either cover the lines or run right over them. For someone like Randy, who draws and paints in a much looser style and has better control over his brushes, this isn’t necessarily a problem. 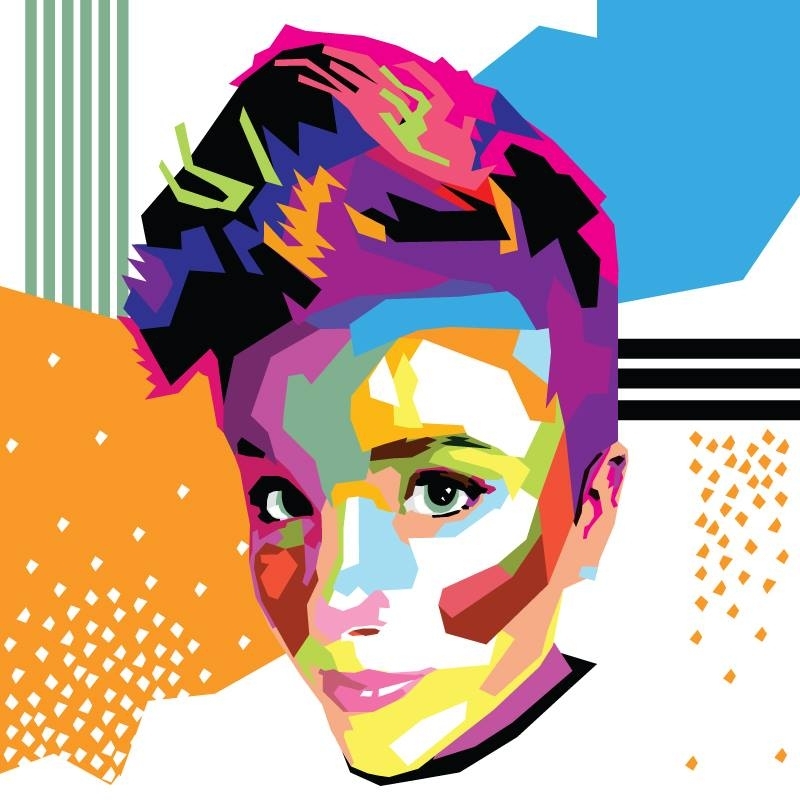 I, on the other hand, am enough of a control freak that I can’t stand coloring outside the lines, but I have very little experience using brushes for fine details, so I did a little experimenting to find more suitable materials. I actually initially created this as digital drawing practice. In the mean time, I really wanted to pull out the watercolors and play this weekend, so I re-drew the giraffe on watercolor paper, and got out my Speedball pens for a little fancy inking. Unfortunately, on my first pass at the supply cabinet, I couldn’t find my bottle of India ink, and instead used Black Magic which, it turns out, bleeds a lot before drying on the page. So I had the lines down, but they were really fuzzy. I unearthed the India ink, and was very happy to find through some controlled experimentation that it did not bleed, and that after a little practice, I could make pretty nice lines with a size 0 brush that would mostly cover the fuzzy sins of the Black Magic ink. What followed was a very long evening of painstakingly slow drawing with an overabundance of careful muscle control. The finished line drawing had only a few hints of the messy first layer. I took even more time coloring. I started with the easiest bits – first the yellow ochre and burnt umber sand, then the base cobalt blue layer for the water and the lemon yellow of the sunset. I still have a good bit to learn about color theory, but I was pretty happy with the layering effects of vermilion for the darker red/orange shades, and Prussian blue in the sky and reflected colors in the water. The main lesson of the background work was to leave more white space. Watercolor is not a reductive process, and white paint doesn’t very effectively dilute or cover color that’s already down on the page. The India ink solved several of the problems that had plagued me before. It did function as an effective barrier for the more watery paint (to a reasonable extent). It also resisted some of the paint that ended up on top of it. The dryer mixes were more prone to showing up over the black lines, but even then, the black is bold enough to show through. 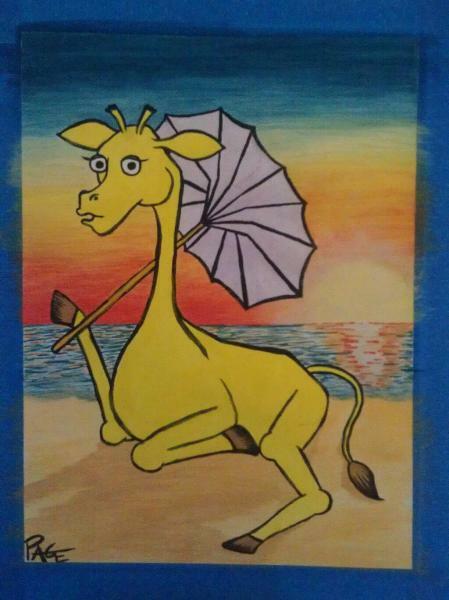 I finished the parasol and put down the base yellow on the giraffe then left everything to get really good and dry before I tackled the spots. I was actually pretty terrified of the spots. Giraffe spots are distinctly indistinct – they’re irregularly shaped yet relatively regularly spaced. I am fairly awful at randomization, but I intentionally didn’t include the spots in the line art because I wanted to challenge myself to be a little messy. It was a very pleasant change of pace to just let the brush wander where it wanted. I wound up having a grand old time making all the little mismatched spots, and only lost focus and drifted out of the lines once. 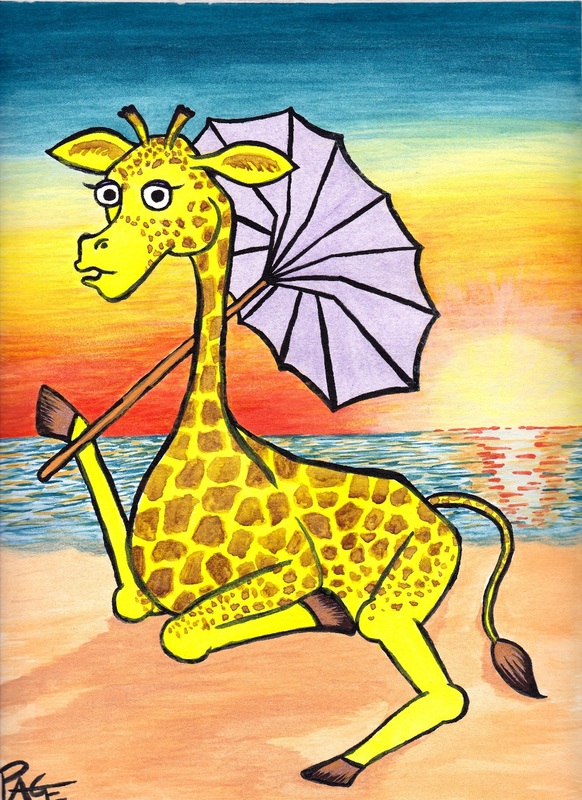 I call her “an American giraffe in Peru” – inspired by a very funny friend who has spent the last few months adventuring in South America and sending back amazing stories and pictures along the way. My usual method of cartooning is pencil drawing, relatively quick-and-dirty inking with permanent marker in the sketch book, then scanning and inking a second time digitally before coloring. I waste time with the extra inking step because I generally don’t have the patience or trust in my own fine motor control to get the lines right on the first try, and digital inking allows me to use the “undo” function to maddening excess. Once you put India ink on paper, it doesn’t move. Brushes don’t go where you want if you rush. Brush lines will be uneven if you do not carefully mind the pressure exerted by your hand. Thicker lines cover more sins and add character. Water will dilute many sins, but won’t remove them completely. Watercolor is not a reductive process. Evaporation makes your paint darker. Once you have the color you want, don’t hesitate. If you have to go back and mix a close match that isn’t quite right, that’s ok too. When you step back a little, all those tiny mistakes are barely noticeable. I will almost certainly be doing more of these. I feel like I’ve learned a lot in the last week, and now I want to practice. A lot of what I’m learning on paper will help my digital drawing as well.